Simulated Mars Soil was developed in 2007 by NASA and JPL Scientists working on the Mars Phoenix mission. It's still used today to develop future Mars missions, support rover operations, and conduct planetary science research. Mars has a unique environment - temperature can vary wildly between day and night, and global dust storms can blot out the sun for weeks at a time. The surface is covered by sand and dust - formed by the erosion of iron-rich igneous rocks that are similar to basalt. This material is known as "Regolith", the Martian soil. Carried by the wind and suspended in the atmosphere, this dust poses a constant risk to hardware on the surface of Mars. Solar panels can be covered, intake filters can clog, and moving parts can lock. On future manned missions, the Martian regolith could even pose health threats to astronauts if not properly mitigated. What useful products (fuel, oxygen, building materials, etc.) that can be efficiently extracted from the regolith soil remain to be seen - and how well will Earth-based plant life do if grown in Martian soil? Use our Simulated Mars Soil to provide answers some of these questions. Great for experimentation, science fair projects, etc. The soil contains the following compounds: S1O2, Fe2O3, Al2O3Ca),MgO, SO3, Na2O, P2O5, TiO2, K2O, MnO, and Cr2O3. The particle size is 0.5-1.27 mm (500-1270 microns). 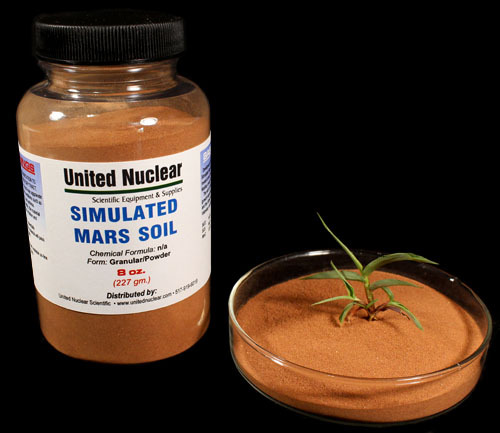 Simulated Mars Soil is available in 8 ounce, 1 pound and 2 pound containers (make selection below).